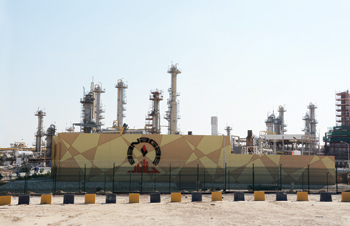 BAHRAIN National Gas Company (Banagas) is a natural gas and related energy service provider. 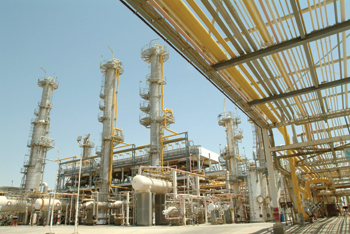 The company operates LPG plant facilities to recover propane, butane and naphtha from associated gas and refinery off gas, which are used as fuel for furnaces and gas turbines, power stations and refineries in Bahrain. It transports liquefied propane and butane to refrigerated storage for ship loading at Sitra Wharf and naphtha to Bahrain petroleum refinery for storage. The company operates two gas-processing trains with a total feed gas through put of about 300 million standard cubic feet per day (mmscfd). Bahrain’s Energy Minister Dr Abdul Hussain bin Ali Mirza commissioned Banagas’s ninth compressor station (CS9) recently. Built at a cost of $42.4 million, the new station is designed to compress and deliver about 60 mmscfd of associated and refinery off-gas. The project that included gas gathering, transmission lines and a new central control centre was executed by Japan’s JGC Gulf International under an engineering, procurement and construction contract awarded in 2011. The station started partial operations in October 2013 and it is among the only two high-capacity stations capable of 60 mmscfd capacity, the other being CS7. The other stations are operating in the 20 mmscfd to 40 mmscfd range and CS9 is aimed at reducing the burden on other compressing stations. CS9’s compressor turbine will be fired by residue gas methane and ethane. It will help ensure continuous handling of up to 310 mmscfd of associated and refinery off gas. With the commissioning of the new station, Banagas will be able to comply with the National Oil and Gas Authority (noga) directive of ‘no flare, no vent’. Banagas operates LPG plant facilities to recover propane, butane and naphtha from associated gas (from oil wells) and refinery off gas. Liquefied propane and butane are transferred to refrigerated storage tanks located at the Sitra Wharf area for ship loading. Naphtha is sent to the Bahrain Petroleum Refinery (Bapco) for storage and subsequent export. The residue gas is used as fuel for Banagas furnaces and gas turbines, and the rest is supplied to Aluminum Bahrain (Alba), Riffa Power Station and the Bapco Refinery. This residue gas, of about 250 mmscfd, represents 25 per cent of Bahrain’s daily fuel gas consumption. The original plant was commissioned in 1980 with capacity of 110 mmscfd of associated gas. At present Banagas operates two gas-processing trains with a total feed gas through put of about 300 mmscfd. Bahrain oilfield: The low pressure associated gas is collected from 16 well manifolds in the Bahrain Oil Field. The gas is separated in Gas Oil Separators (GOSP’s) which are operated by Tatweer Petroleum, the Bahrain Field Operator, at a controlled pressure of about 35 pounds per square inch guage (psig). The gas from the well manifolds is distributed to all seven compressor stations operated by Banagas. Additionally, low pressure non dehydrated refinery off gas is also supplied from Bapco refinery to compressor stations 6 and 7, where it is compressed along with the associated gas and delivered to the Central Gas Plant for LPG recovery. Compressor stations: At each compressor station, gas from several GOSP’s is gathered into an inlet header and compressed by two-stage centrifugal compressors driven by a gas turbine to about 420 psig. The gas is then cooled by air fans to about 110 deg F.
During this process some of the gas is condensed and sent to Banagas’s Central Gas Plant (CGP) as condensate. The compressed gas however contains some water vapour and acidic gases like carbon dioxide and hydrogen sulphide. The water vapour may condense in the pipe line due to natural cooling and the free water, together with hydrogen sulphide and carbon dioxide present in the associated gas stream, will form corrosive acid. To avoid this the compressed gas is dried in a Glycol Dehydration Unit (GDU) located in each compressor station before being pumped through gas pipelines to the CGP. Condensate system: Condensate from the compressor stations and from the gas separation system is distilled in a stabiliser column to remove light gas components such as methane and ethane. The stabilised condensate is fed to the depropaniser, while the light gases join the inlet gas. Separation section: The compressed gas, at 420 pounds per square inch absolute (psia) and a dew point of 40 deg F, enter the separation section where liquids are removed. Any solid residue is separated and removed from the process by the filter separator. Dehydration: The gas leaving the separation section is dehydrated to a dew point of -45 deg F to prevent the formation of hydrates in the subzero absorption section. Triethylene glycol is used to absorb any water from the gas. Absorber: In the absorber column the refrigerated feed gas and lean oil are intermingled at a temperature of minus 35 deg F to allow the lean oil to absorb the LPG products of propane and heavier components from the gas and become a rich oil. The residue gas leaves the absorber is used as fuel gas by Banagas as well as neighbouring industries. The absorption of LPG is accelerated by high pressure and low temperature. Refrigeration of the feed gas and product streams is provided via a closed loop circulation of refrigerant propane using two gas turbine driven centrifugal compressors at each train. Deethaniser: The purpose of the deethaniser is to remove ethane and lighter components from the rich oil in order to maintain a maximum of 2 per cent ethane in propane. The overhead vapour is recycled to the absorber section to recover any escaped propane and heavier components. The deethaniser bottoms are fed to the rich oil still column. Rich oil still column/hot oil system: In the rich oil still, lean oil is separated by distillation from the absorbed LPG products. These LPG products go overhead and are condensed by the rich oil still reflux condenser and then routed to the fractionation columns. The liquid from the bottom of the rich oil still is circulated through the hot oil system as a source of heat for all the plant reboilers and part of it is used as absorbent lean oil. The hot oil temperature is maintained by a gas fired heater. Treating section: Propane and butane contain contaminants such as hydrogen sulphide, carbonyl sulphide and mercaptans. For the removal of carbonyl sulphide and mercaptans both propane and butane products are treated in a fluidised bed of solid potassium hydroxide (KOH). Prior to this, propane product is treated by diethanol amine solution to remove hydrogen sulphide. Intermediate storage section: Treated propane and butane products are routed to horizontal tanks (bullets). After the product is circulated and analysed to confirm the product specification it is routed to spherical tanks located in the intermediate storage at the CGP. If any product fails to meet the required specification, it is returned to the gas plant to be reprocessed. Only “on-spec-products” are pumped via a 20 km pipe line from their respective spheres to the refrigerated storage tanks located at the Bapco Wharf area at Sitra. A very small quantity of propane product is sold in the local market, which is loaded in pressurised trucks. Naphtha product is stored in floating roof tanks. “On-spec” Naphtha product is pumped directly to the Bapco refinery for storage and subsequent export. Refrigerated storage and shipping: At Sitra, liquid propane from the gas plant is received into the surge drum at 356 psig and 120 deg F. Some of the propane is used as refrigerant, first in the butane chillers and then in the butane sub-coolers. During this process butane is cooled to +25 deg F and the liquid propane is flashed into vapour. The balance of the propane is flashed to its boiling point of -45 deg F into the propane storage tank. Product shipping: The LPG shipping facilities consist of two loading pumps each with a rated capacity of 5,000 bbls per hour, a 16-inch loading line and a 10-inch vapour return line, each of which is fitted with fully articulated arms. Banagas produces approximately 3000 bbls of propane, 3200 bbls of butane and 4500 bbls of naphtha per day for its own account as well as 2500 bbls of product from Refinery Off Gas under a processing fee agreement with Bapco. These products are exported to various parts of the world where they are used as industrial and domestic fuel while some also finds its way into petrochemical feed stock.